A couple enjoying some BBQ in front of the Santa Ana Star Center. 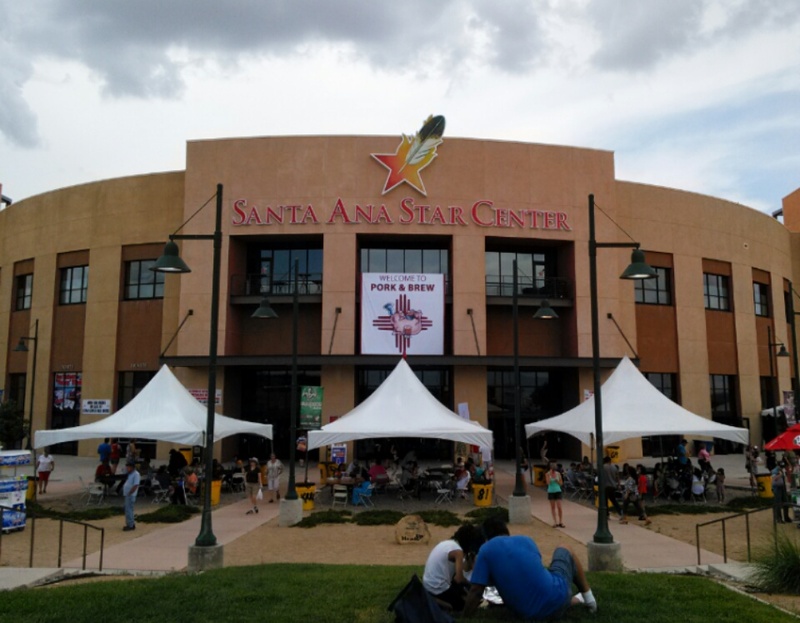 It started out as a perfect summer day at the 12th Annual Pork & Brew at the Santa Ana Star Center. There was just enough cloud cover and sun to make the start of this event perfect. Getting out of our car, the wonderful smoky aroma hit us immediately. We usually fuel up on food first, but we had a feeling the delicious local BBQ would totally trash our palates for the beer so we headed over to the craft beer tents. 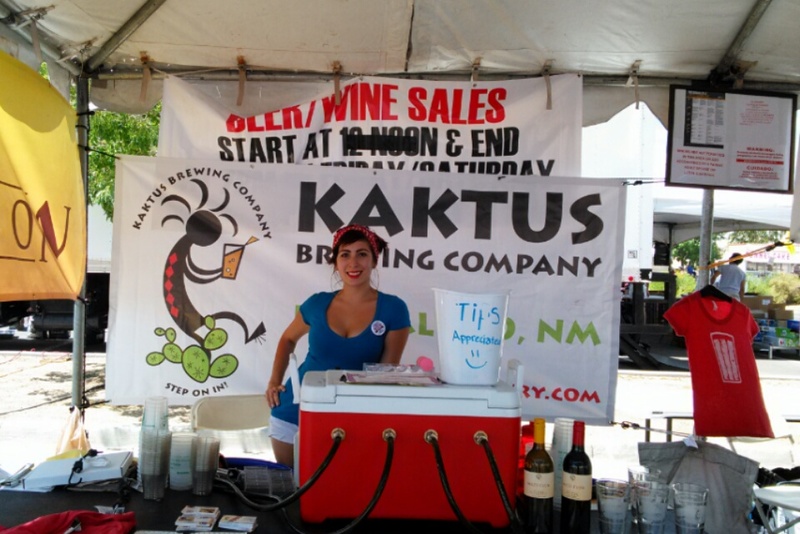 Four breweries were featured in this event — Kaktus, Red Door, Turtle Mountain, and Cazuela’s. 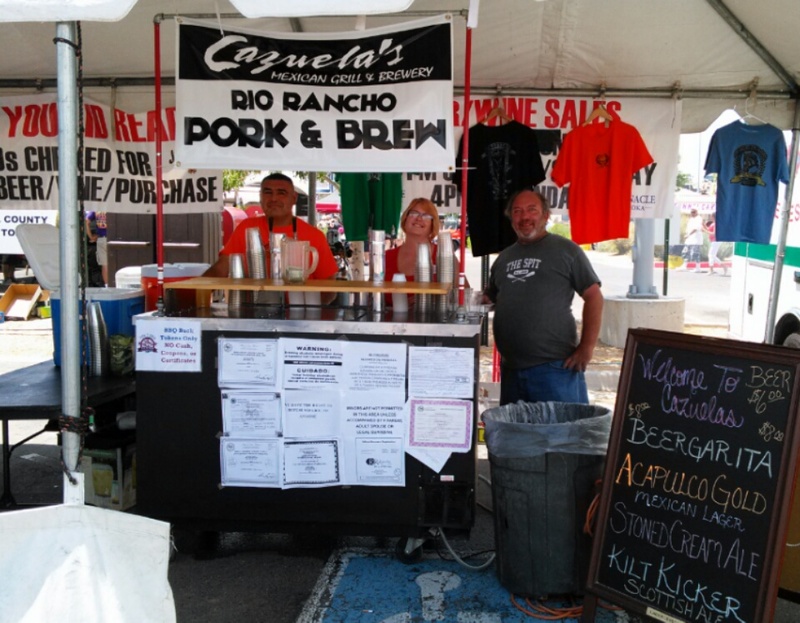 Hello, brewer Mike Campbell (right) and the Cazuela’s staff. Our first stop was at Cazuela’s, where they offered a Beergarita (5% ABV), a better version of the ‘rita beers that are so popular at the supermarket lately. It was a blend of one of their beers and margarita ingredients that seemed to be very popular at this event. They also had their Acapulco Gold Mexican Lager (6% ABV), Piedra Del Fuego Stoned Cream Ale (6% ABV), and the hubby’s favorite, Kilt Kicker Scottish Ale (6%). Both the Stoned Cream Ale and the Kilt Kicker Scottish Ale sold out a few hours into the event. The Red Door staff sport a professional look. 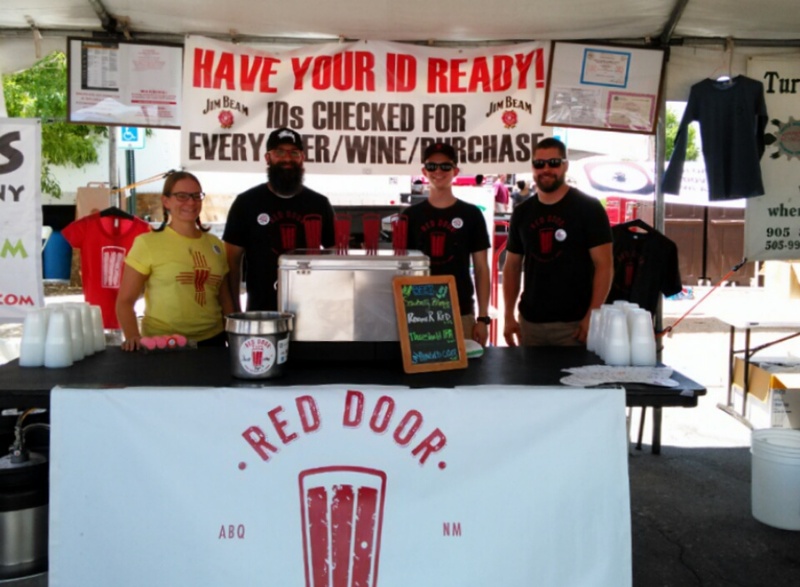 Red Door’s beers included Sowbelly Blonde (4.9% ABV), a delicious, light summer ale brewed especially for the event. It was a beer that was different than their house blonde by shorting the mash time and dry-hopping the brew a little more to make it lighter and crisper. It definitely was. They also offered their Roamer Red (6.2% ABV), Threshold IPA (6.6% ABV), and their ever-popular Unhinged Cider (7% ABV). 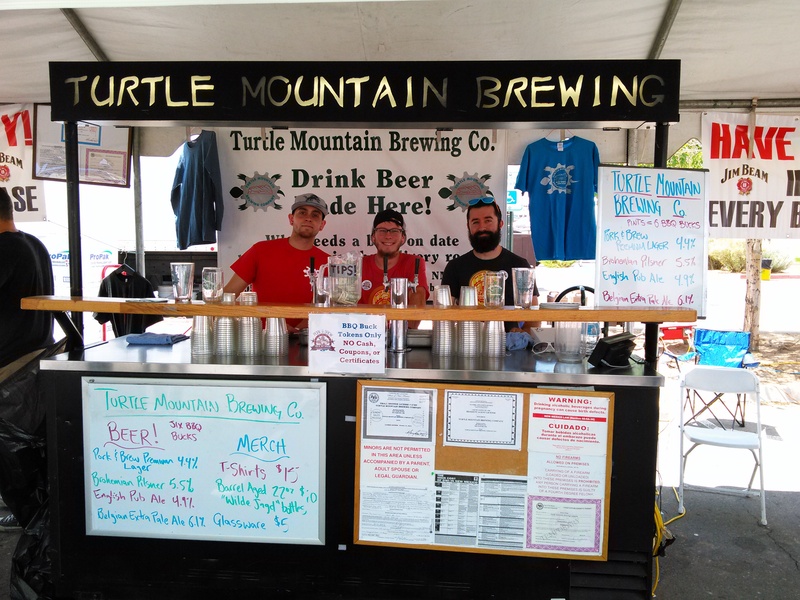 Brewer Tim Woodward, right, and the Turtle Mountain team brought a whole lot of fun. Turtle Mountain also had some great beers ready for this event. Their Pork & Brew Premium Lager (4.4% ABV) will be available at the brewery as well. They also had their Brohemian Pilsner (5.5% ABV), English Pub Ale (4.9% ABV), and my favorite of the event, the Belgian Extra Pale Ale (6.1% ABV). The Belgian isn’t on tap at Turtle Mountain though, it was a well thought-out combination of their Mannekin Pale Ale (75-percent of the brewer) and their Hopshell IPA (25 percent). They told us they are dropping the Pilsner and Pub Ale to introduce a Kolsch and a DIPA at the brewery. Kenneth from Nomad’s is working the grill. After our sampling it was time to wander the grounds and get some grub. Our noses led us to Nomad’s BBQ, where we bought a pulled pork sandwich that well exceeded our expectations. The old-school smoker grills they were using made for some delicious, smoky fare. I kind of have a feeling that any food purchased at this event would have been delicious. I washed my sandwich down with a Belgian Extra Pale Ale from Turtle Mountain and the hubby chose the Kilt Kicker from Cazuela’s. As we were finishing up our beers, a downpour occurred. People were crowded under the tents waiting for it to pass. We had a chance to have another pint and visit with some folks enjoying this event. I heard absolutely no complaints on this event and I must agree that it was outstanding. Thank you to everyone involved in Pork & Brew. See you in 2016!